What happens when you take more than a dozen talented winemakers, add a caterer known for great food, mix in a dance-inspiring band, all in a friendly and laid-back block-party atmosphere that feels like a neighborhood get-together? 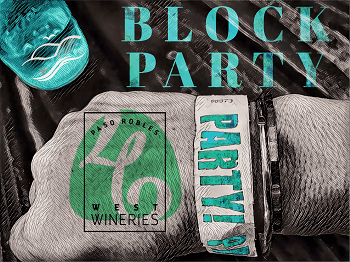 You get one of the most fun events in Paso Robles wine country—the 46 West Wineries Association Block Party. 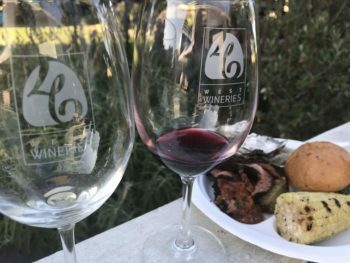 Because one great party is not enough, the wineries along the scenic Highway 46 West Wine Trail of Paso Robles gather twice a year—summer and fall—to celebrate wine, friends, and fun. The Summer Block Party is held on the Saturday closest to the Fourth of July (but not actually on July 4th if it falls on a Saturday). The Harvest Block Party is held the Saturday of Labor Day weekend. For each block party, the location rotates between different members of the 46 West Winery Association. Here’s a glimpse at the fun from a past block party evening. Going strong for about 10 years now, the Block Parties are celebrations for both attendees and member wineries of the nonprofit 46 West Wine Association. Caterer: Paso Catering (www.pasocatering.com) will be serving traditional Spanish Paella with chicken and sausage. Delish! Music: Sound Effect (FB @soundeffectband), a five-piece band from Oxnard with a repertoire ranging from funk to R&B, soul, rock, and jazz. 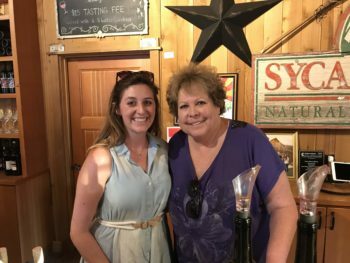 Maribeth Jacobsen, co-owner of Doce Robles Winery and founding member of the 46 West Wineries Association, and Katy Michelle, Doce Robles Winery tasting room manager, pouring at a recent block party. The 46 West Block Parties are designed to be casual, friendly, and laid back. And they’re purposely kept small to maintain that friendly feeling of a neighborhood party instead of a big wine festival or event. Because the event has limited tickets, it’s good to get tickets early. The price is all-inclusive so you can concentrate on enjoying yourself. Block Party-goers relaxing on the lawn area of a recent summer block party. When you arrive and get your entry wrist band (you may notice it says PartyPartyParty all the way around), your hardest decision of the evening will be what to do first: eat, enjoy a glass of wine, or take a reconnaissance stroll around the grounds. No matter how you choose to begin, the Block Party is all about a fun, low-key atmosphere. No long lines, no huge crowds, no pushy partiers. Just a positive group of people enjoying the best of what the Central Coast has to offer. 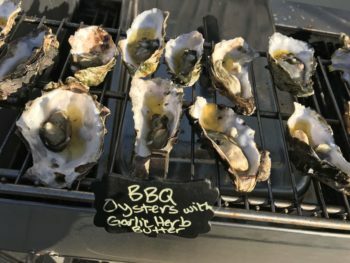 Barbecued oysters and tri tip were on the menu from Paso Catering at a past block party. Dinner at the block parties is the real deal. No matter what the caterer chooses, you can be sure it will be more than an appetizer or two. The live band at each block party is chosen to be dance-inducing, so don’t be shy if you’re inclined to move to the beat. Wines are provided by the 17 member wineries of the 46 West Wineries Association. This group of wineries on the west side of Paso Robles creates a range of great wines showcasing the grapes that do well in this region. See the full list below. 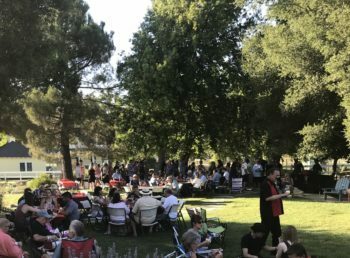 The 46 West Wineries Association block parties share great wine, food, and music for a relaxing and fun evening. Tickets are $55, and include dinner, wine, and music. The event is small and sells out, so get tickets soon so you don’t miss out. Because it’s a wine event, it’s for ages 21 and over, and dogs have to stay home with the kids and the babysitter. The Flavor Team thanks the 46 West Wineries Association for creating these great events.